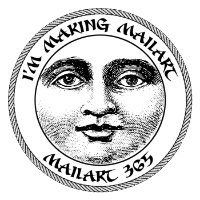 This badge has been issued by the Community Administrator at Mailart 365 to recognise the successful completion of 365 pieces of mailart by the holder. Mailart is a personal artwork added to a piece of postal correspondence that makes it’s way through the (snail mail) postal system from one person to another. In this age of digital communications, these personal touches and connections are getting harder and harder to find, so mailart looks to keep this tradition alive. The mailart 365 project was set up in December 2010, with the aim of sending 365 illustrated posts in a year. Anyone is welcome to take part. To earn this badge, the user had to create 365 pieces of postal art with the intention of sending them in the post. There are no fixed rules on how you go about doing this, it’s your own personal challenge. Just get to 365 and have fun doing so.